I'm on a beauty-blog mode, so please bear with me.. I am slowly but certainly starting a collection of NARS products; started with the concealer and eyeliners that I got while nightstopping in Bangkok, then the blush palette that I bought online. Then NARS opened up a store in Pavilion Mall.. *dun dun dunn* I got the lovely satin lip pencil last month, and since then I've bought a lipstick and a nail polish! So today I'll be writing about the incredible nail polish that I got from their Guy Bourdain Holiday Collection! 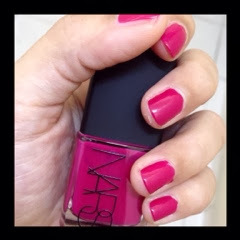 This Opaque Nail Polish in the shade Follow Me retails at RM 60. Described as "deep fuschia" on the website, I would have to say that it is pretty accurate. And when they say "opaque", they really meant it! I only had ONE coat on for the picture! The thing that I need to point out though, is the fact that the retail price in the US is $19, which according to my currency exchange app, the nail polish is actually cheaper here (surprise!) where as OPI nail polishes that are also sold at RM 60 here is actually around $9 to $12 in the US! I don't know about you, but that price difference kinda irks me a bit. Makes me want to get all the Opaque Nail Polish that I can get my hands on, except that I have way too many nail polishes already!